Another Christmas has come and gone and, believe it or not, I have no pictures other than the tree-trimming pictures. I was too busy cooking. But, trust me when I say that we had a good day. I must have been a good girl because Santa was ever so good to me. Bill gave me earrings and a necklace, both very pretty. I also dropped hints for the Harmony options set from Knit Picks. Since the wood needles are backordered now, I was surprised and delighted to unwrap them. They're beautiful and so nice to knit with. Kim and Kelly used my Amazon wish list and I also got some gift cards and things. 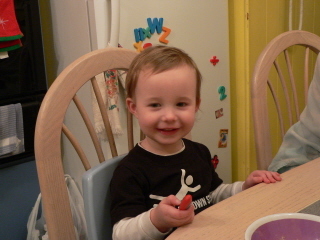 Lorelai was funny on Christmas day. 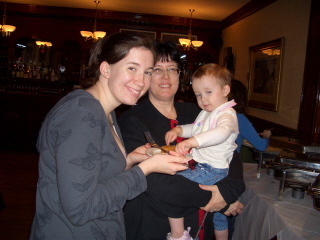 She was a little overwhelmed, I think, by all the gifts for her. She'd open one, start to play with it and have no interest in opening anything else. 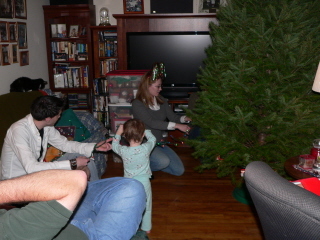 We introduced more gifts as the day went on but she still has one more to open here. I'm continuing to practice spinning and I got a little more knitting done this week while on vacation. 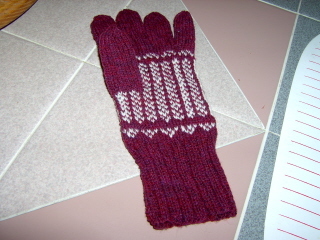 I finished mittens for myself using my handspun yarn. This is the yarn spun with the fiber from Black Berry Hill Farm that I got at Rhinebeck (the wool/llama/alpaca). 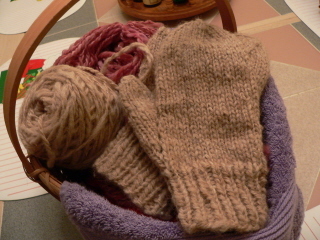 It was a pleasure to knit with and the mittens are so soft and warm. 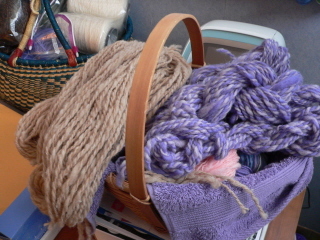 I also made a hat with the purple/lavender yarn on the right in this picture. This yarn is a little bit bulky since it's the first yarn I plied so the hat is a little big and bulky but it will definitely be warm. I'm also working on a pound of Coopworth roving in a medium gray that's really easy to spin. 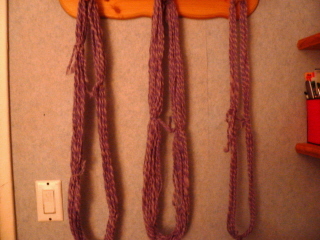 I have two skeins done and drying at the moment. I had a little bit of the singles left after plying so I washed that so I could knit a swatch to see how it looked. Later today, as I was straightening up, I was looking at some swatches I had and realized something. 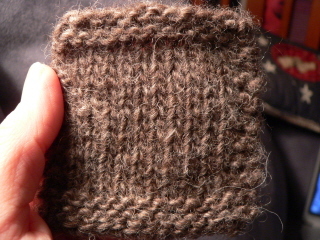 My handspun swatch resembled a swatch I made with some Brown Sheep wool. 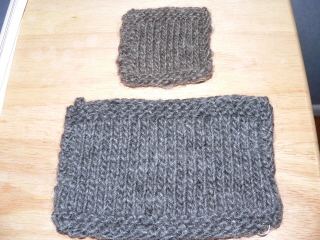 The little swatch at the top is my handspun and the larger swatch on the bottom is Brown Sheep wool. I washed some of the alpaca yesterday. I carded some of it, using the tutorial on Joy of Handspinning.com. I started spinning with it. It's difficult when I've been used to prepared rovings. It will take some getting used to. 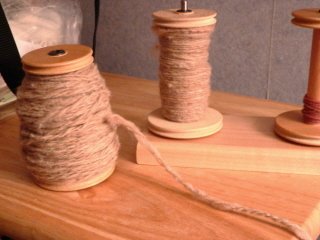 It seems like it should be spun thin, which is a little hard for me as a beginner. I'll just keep at it. 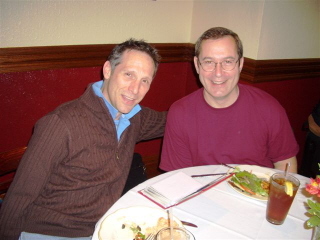 The day after Christmas, Bill and I went to see Sweeney Todd. Holy cow. What a movie. Bill was a bit put off by the copious amounts of blood. It is rather violent. Strangely enough, I was able to overlook that part by just not focusing on it. I really liked the boy who played Toby and Johnny Depp, well, what can you say. He's brilliant. Kelly said she didn't miss the ballad at the beginning but did at the end. She said that for her, Sweeney ends with "dun, dun, dun, DUN!" It's a really good adaptation, even if some of the music wasn't used. 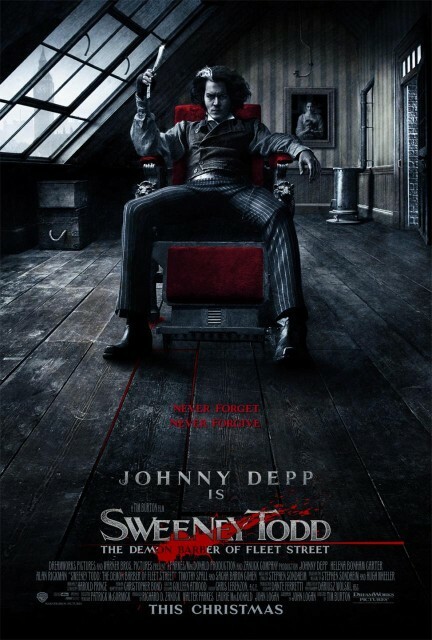 The only thing I missed, and it's minor, is the ferocity with which Sweeney bellows, "At last! My arm is complete again!" Johnny Depp had a different take on it. One of my gifts, from Billy, was the dvd of Pirates of the Caribbean 3 and we watched it last night. It's full of action but it's so confusing. The ships change hands so many times, I never knew who was "captain" of what ship at whatever time. But what the heck. We know why I watch these movies. 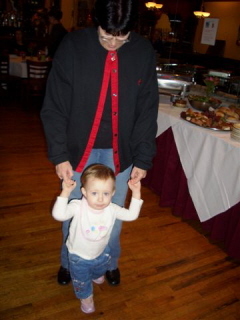 This is the only picture like this that I could find. Apparently, someone took this with their cell phone camera in the movie theatre. Be still my heart. Well, vacation's over after Tuesday. It's been so nice! 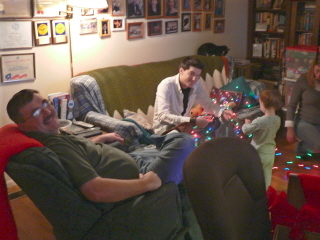 Dad and Billy supervise the lights. Spinning lessons ended today. I had so much fun learning this, I can't tell you. I'm confident that with practice, I can really do this. I have a week off after Christmas so I have time to play. The results of five weeks of lessons. 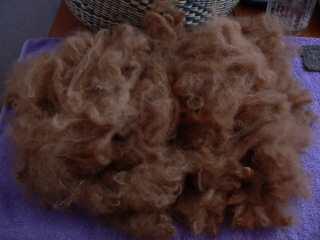 I'm practicing working with this small amount of alpaca before tackling the fleece. I need to do some research into preparing it first. The picture is deceiving. 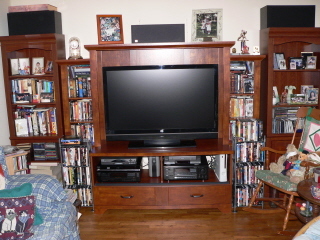 The color is really a soft brown, with some white streaks that make it look a bit tweedy in spots. It's really nice, very soft. It's so cold. I'm typing with fingerless mittens. 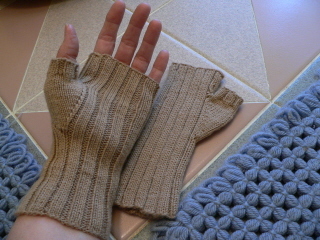 I made these because I thought the pattern was cute but didn't think I'd get much use out of them. I've discovered uses for them, though. I've been wearing them at work. 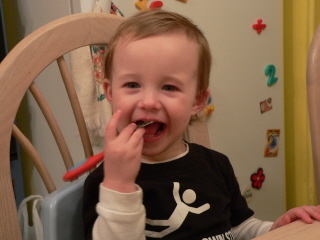 I can sign with them, even fingerspelling, and they're almost flesh color so they're not distracting. They keep my thumb joints warm, which is a good thing. Signing through the cold when my hands are stiff isn't a good thing to do. 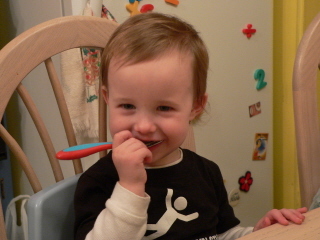 So, keeping the thumbs and wrists warm seems to help. I think it's supposed to warm up later in the day. I sure hope so. And the reason the house has been upside down for a few days. 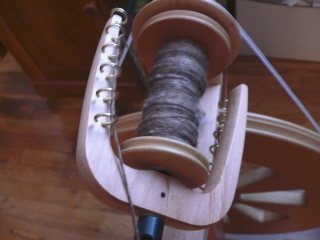 Amazingly, I've actually found time for some spinning. This is the yarn I plied at Saturday's lesson. It's a terrible picture. I'll try to take a better one when it's all dry. It's purple and lavender plied together and I'm so impressed with how balanced it is. This is 73 and a half yards. I have more of both fibers so I hope I can get enough for mittens or a hat. Next, I'm working on this. I bought this fiber at Rhinebeck. It's a caramel color and it's cormo wool/llama/alpaca blend. It feels really soft. I don't know how many yards it is yet. 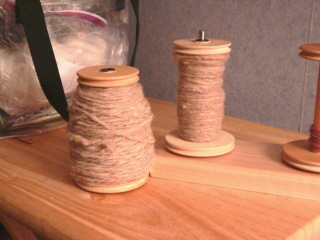 The bobbin on the left has been plied. The one on the right is the singles I did this afternoon. That's a plied strand. The new one, on the right, looks fairly even. 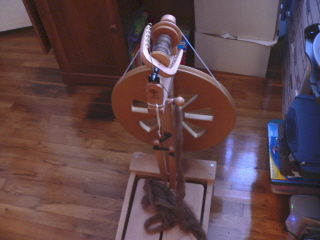 I have one more ounce of this to spin and then I'll ply them and see how much yarn I have. This is what I've been working on since I started lessons. 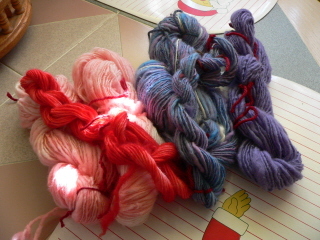 On the left is some wool I dyed using koolaid, cherry and pink lemonade. 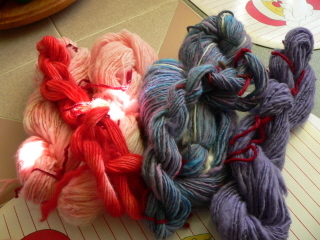 I didn't dye the yarn on the right. 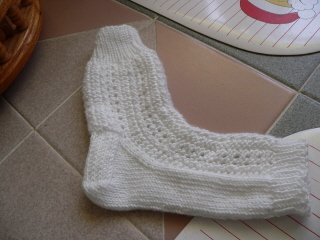 I finished this sock yesterday while babysitting for Lorelai. It's a toeless pedicure sock. Isn't it cute? The lace pattern is supposed to go all around the foot part but I prefer walking on plain stockinette stitch so I changed it. 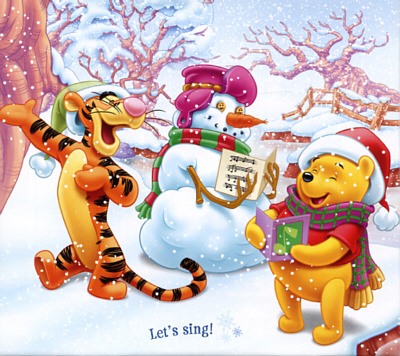 Wow, Pooh looks comfy. I'm about ready to join him. Yep, still December 13. 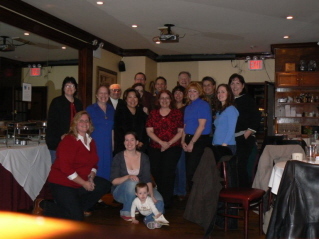 I realized that I never posted the group shot from the Pimpernel reunion party. The small but dedicated group. A picture's worth a thousand words. None necessary here. The date should tell you that this month, there just isn't enough time for everything I want to do. Every time I thought of the website, I was just too tired to do anything. I've been getting ready for the holiday. I have all the online shopping done. I have a few things to pick up in actual stores but not a lot. 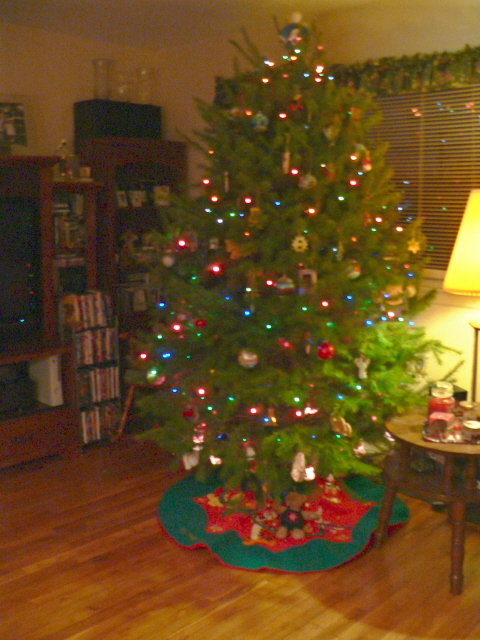 I still have to mail the Christmas cards, and this is really late for me. I started them today. I'm going for a haircut tomorrow so I hope I'll be able to do it after that. So, one trip to the post office should do it for the mailings this year. I have two more spinning classes left. I'm really encouraged by my progress. This Saturday, I will learn to ply. My yarn is getting more even and is sort of balanced but I can see it will take a lot of practice to be able to judge the amount of twist necessary for each different fiber I use. Even with the learning curve, I find it very relaxing, soothing and so much fun. I also tried dyeing the yarn with koolaid. That looks pretty good. I'll take some pictures when I have a chance. 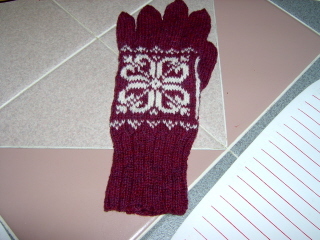 I'm making progress on the fair isle technique gloves. One is complete. I even like the design on the palm. I probably won't start the other one until after Christmas. Too much going on now for me to even think about following the chart. I'm still working on the lilac feather and fan shawl. I'm working on the lace pattern now but, again, I need time to really concentrate so I'm not doing that one at the moment. Right now, I'm catching up on socks. Actually, at the moment, sleep is what I need. Pooh has the right idea.